If you want to get everyone talking about your nachos, make sure your recipe includes steak strips, avocado crema, shredded cheese and pico de gallo. 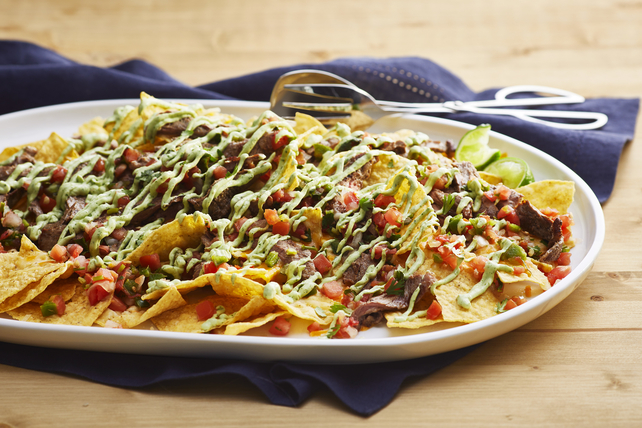 Just follow our simple steps and you'll be serving up these Avocado Crema-Steak Nachos in no time! Combine dry seasonings; sprinkle evenly onto both sides of steak. Grill 5 to 7 min. on each side or until steak is cooked to medium doneness. Transfer steak to cutting board. Let stand 5 min. before cutting across the grain into thin slices. Meanwhile, heat oven to 400°F. Blend cream cheese product, lime juice, avocados and cilantro in blender until smooth. Pour into resealable plastic bag. Spread tortilla chips onto rimmed baking sheet; top with meat and shredded cheese. Bake 5 min. or until cheese is melted. Cut small piece off one bottom corner of bag; use to drizzle cream cheese sauce over nachos. Top with pico de gallo. Resting Meat: Why and How Long? Roasted and grilled meats should be rested by covering loosely with foil before serving. During cooking, meats' flavourful juices concentrate near the exterior; resting allows the juices to redistribute throughout the meat and prevents the juices from releasing when cut. Individual steaks or chops can be rested for 5 min. or less. Larger cuts of meat up to 2 lb. (900 g) should be rested 10 min. or so. Roasts should be rested 10 to 20 min., depending upon how large they are.